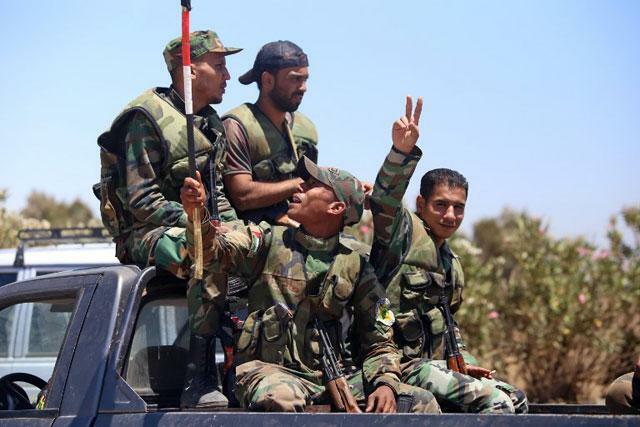 DAMASCUS — Syria’s army has issued demobilisation orders for a new round of men conscripted for compulsory service in 2010, a year before the civil war started. The decision, announced by state media on Monday, ends the drawn-out deployment of Syrians who enlisted for between 18 months and two years of mandatory military service that year, but who ended up serving for more than eight years because of the conflict. The army issued ‘‘an order to demobilise officers from Recruitment Class 103’’ and recruits drafted in 2010, state news agency SANA said. The order, which comes into effect on Wednesday, also demobilises officers and reservists enrolled before July 2012. Those who wished to continue fighting in the army’s ranks could request to do so, SANA reported the order as saying. It is the latest order to let go conscripts as the war winds down and the Damascus regime finds itself in control of almost two-thirds of the country. In May, the army ‘‘issued a decision to demobilise the officers and reservists of Recruitment Class 102’’, also drafted in 2010. In previous orders issued in November and earlier this month, the army let go other recruits — officers and reservists conscripted in 2013. Before Syria’s war started in 2011, men aged 18 and older had to serve between 18 months and two years in the armed forces, after which they remained part of the reserves. But when war broke out, anyone enlisted remained deployed on active duty. The regime initially lost swathes of territory and its 300,000-strong army was nearly halved by deaths, injuries and defections. But Russian air strikes, local militiamen and fighters from Iran, Iraq, Lebanon and elsewhere have helped it recapture much of the territory it lost.